Do you want to learn more about the European Parliament elections, youth participation and win an Interrail ticket? 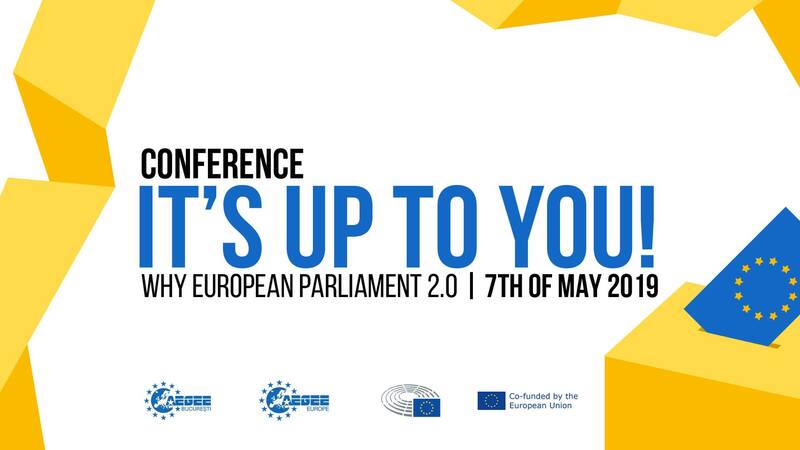 Then you should not miss the one-day Agora pre-event ”It’s up to you!” on 7th of May. More about it in this interview. Golden Times: What’s the pre-event conference “It’s up to you!” on 7th of May about? AEGEE-București: The Conference ”It’s up to you!” will give you the opportunity to express your ideas on youth participation matters through panel discussions, workshops and presentations. Together with field experts and other European students you will tackle the topic of civic engagement, European Parliament elections and the influence of local and European institutions in the life of young people. GT: What will be exact the programme, topics and who will be the speakers? AEGEE-București: The registration starts at 12:30 and will finish one hour later, at 1:30 in the afternoon. From 1.30 to 3.30 there will be the Panel Discussion “Connecting EU with Youth”, followed by a coffee break. From 4:30 to 6:30 in the afternoon there will be thematic workshops and presentations. We don’t have the speakers confirmed yet, but as soon as we have something, we will let you know. GT: Will the event also reflect on the specific political situation in Romania? AEGEE-București: We want to make the Conference about the importance of the European Paliament elections and less about the Romanian political situation. As you know, it is a controversial subject as the political situation is not very stable. GT: Particpants can also win an Interrail ticket. How? The contest can be found on AEGEE-Bucuresti Facebook page. GT: Anything you want to add? AEGEE-București: We would like to add the fact that the admission is free for all the participants that are willing to come. For the AEGEEans that need accommodation, we can take care of this aspect, the fee would be 15 Euro.